When I arrived in Brighton as an 18-year-old, I expected to find some sort of queer paradise: the kind of place where rainbow flags lined the streets and poodles and gimps crawled interchangeably on leads in the hands of beautiful drag queens. Or, at least a bit more of that kind of stuff than what the urinals of a drab Doncaster shopping centre had to offer. When I arrived at work on Monday morning and saw the lead story in the local paper – that two young women were told they’d be chucked out of Sainsbury’s if they continued to “display public signs of affection” – it stirred a familiar sickness in my gut. 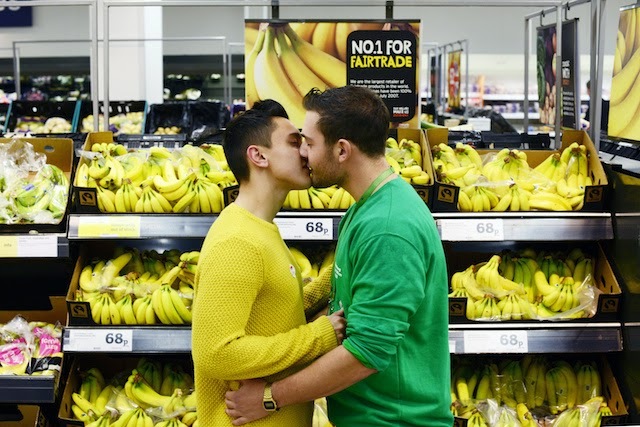 Gay couple asked to leave Sainsbury's after a peck on the cheek, The Argus.